The winning team was Renfrewshire A - Sean Burns, Stuart Cameron and Louis Oliver with a total of 148 for their two best scores out of three. The runners up were Lanarkshire A - Fraser Kane, Dominic Dougan and Graeme Greer with a score of 150. Pictured above - Past President Walter Wood presents the trophy to winner Stuart Cameron of Elderslie. Despite testing underfoot conditions, the sun shone as 21 Boys and Girls representing 9 out of our 10 Course Owning Clubs enjoyed a number of skills tests and fun competitions at our annual event held at Bishopbriggs. Congratulations to all who participated, especially Orla Rooney and Glen Crawford who took home the prizes in the Under 15 event and Charlie Greaves and Matthew Hughes who were joint winners of the Under 13’s section. Many thanks to all the Parents for transport duties, Bishopbriggs for hosting the event and Alastair Forsyth, Gordon Jamison and Andrew Smith for their assistance on the day. It was good to see some encouraging golfing talent on display and look forward to monitoring the progress of all the boys and girls who took part as we plan further coaching/fun events in the near future. Despite some heavy showers the 2017 Boys Championship culminated in a great final match played in the best of spirits. 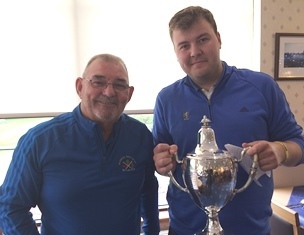 Alsatair Forsyth presented the trophy to Louis Fleming of Haggs Castle GC who beat Chris McMillan of Bishopbriggs 2&1 and commented on the high quality of play from both boys. A special thank you to Cathkin Braes Club Captain Stephen and the members of Cathkin for hosting the event, and to all the boys that played for making it another very successful GGU Competition. Photo: Alastair Forsyth presents the trophy to the winner Louis Fleming of Haggs Castle.